Watson, Ian, and Ian Whates (eds.). 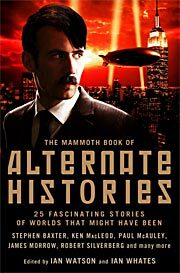 The Mammoth Book of Alternate Histories . Robinson 2010. Watson, Ian, and Ian Whates (eds.). 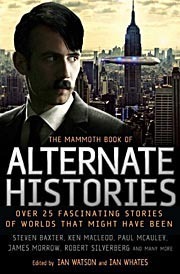 The Mammoth Book of Alternate Histories . Perseus/Running Press 2010. Summary: Anthology of more than 20 allohistorical stories, three original and the rest reprinted, including James Morrow's "The Raft of the Titanic", Ken Macleod's "Sidewinders", Eugene Byrne and Kim Newman's w88 android, Suzette Hayden Elgin's "Hush My Mouth", Harry Harrison and Tom Shippey's "Letter from the Pope", Esther Friesner's "Such a Deal", A.A. Attanasio's "Ink from the New Moon", Pat Cadigan's "Dispatches from the Revolution", Fritz Leiber's "Catch that Zeppelin", Paul McAuley's "A Very British History", Rudy Rucker's "The Imitation Game", Keith Roberts's "Weihnachtsabend", Kim Stanley Robinson's "The Lucky Strike", Marc Laidlaw's "His Powder'd Wig, His Crown of Thorns", Judith Tarr's "Roncesvalles", Ian R. MacLeod's "The English Mutiny", Chris Roberson's "O One", Harry Turtledove's "Islands in the Sea", George Zebrowski's "Lenin in Odessa", Pierre Gévart's "The Einstein Gun", Robert Silverberg's "Tales from the Venia Woods", Gregory Benford's "Manassas Again", Pamela Sargent's "The Sleeping Serpent", Frederik Pohl's "Waiting for the Olympians", and Stephen Baxter's "Darwin Anathema". Published: Robinson 2010 (1845297792); and Perseus/Running Press 2010 (0762438428BUY).